Imagine you are alone in a stranger’s room. The door is closed and locked, and your pants are off. Further, you agreed to let the person you just met work with a very intimate part of your anatomy. Physical therapists, this is the position in which our patients often find themselves. If you are a physical therapist specializing in pelvic floor dysfunction, or aspiring to, you need to read this. On February 5, 2018, Larry Nassar received his final sentencing for sexual assault. You may be familiar with the harrowing accounts of over 50 patients under the medical care of Nassar. In his role as a trusted clinician, he proposed and conducted intravaginal “treatments” under the claim that they were medically necessary. Pelvic floor physical therapists administer intravaginal treatments every day, but instead of healing, Nassar’s patients were left feeling disgusted and confused. Nassar’s legal proceedings showed the world how easily monstrous acts can occur under the guise of medical necessity, even in the presence of a third party. Besides the obvious emotional trauma faced by survivors of sexual abuse, there is also physical trauma that can present years later. Pelvic pain disorders — conditions that many pelvic floor physical therapists face — are highly correlated with sexually abusive encounters.1 Thus, clinicians must maintain an active role in the battle against sexual misconduct in the clinic. Prevention becomes a form of pre-rehabilitation. While we cannot monitor and protect every aspect of our patients’ lives, we can at least prevent abuse from happening under our own clinic’s roof. Clinicians, this is a call to arms. We are responsible for protecting patients from sexual misconduct in the exam room as well as for providing them with optimal care. We also need to be sure our practice conforms to the highest professional standards of transparency and trustworthiness. Here are five ways to keep your patients safe from sexual misconduct. Education should be the patient’s frontline defense. Be sure they are fully informed and educated before any internal procedure. During physical therapy school, learning the typical anatomy of our lab partner helped us learn to recognize atypicality during clinical work. Likewise, if a patient knows what to expect during your typical physical therapy procedure, it will help them recognize misconduct if it occurs. Before performing any internal examination or treatment, I demonstrate the entire procedure on a plastic model, gloved hand and all. Visualization gives patients the opportunity to learn what you are looking for and why. It also gives them a chance to ask questions or voice concerns prior to the procedure. Finally, it gives them a mental guideline of your course of action, so they know what to expect. Education is a powerful tool for increasing patient and practitioner safety. However, patients may still feel vulnerable in the absence of a peer. The next safety technique can be found in the notebook of your first health class. Think to the life-changing lesson that preceded your higher education, and probably saved you from a few playground bullies: There is safety in numbers. Patients should be given the option to have a peer present during internal examinations and treatments. In choosing a peer, I typically suggest that patients bring a relative or close friend who shares their identified gender, or someone who can be active in home treatments (such as a spouse or partner). Relatives and friends typically sit where they cannot see your hands, but their presence can give your patient the confidence to speak up if something feels wrong. When a patient’s sexual partner accompanies them, that person can typically sit beside the therapist and learn via direct visualization of the anatomy if the patient permits it. Support from someone who can see the therapist’s hands provides a direct witness to the therapist’s conduct, further holding you accountable for your actions. When the patient is unable to provide their own social support, I suggest having someone from the office sit in as their peer. But what if the patient opts not to have a second person present? In my travels as a physical therapist, I have come across clinics that use audio surveillance for private exam rooms. There is much to consider when contemplating the use of recording devices. Surveillance laws vary in each state regarding how to document informed consent, how to designate surveilled areas, and how those areas should be identifiable by patrons. Similar to having a peer present, auditory records of exams may hold the therapist more accountable for their actions. Further, if a legal matter arose, a recorded account of events may help uncover the truth. But audio recordings only account for one dimension of the exam. Nassar’s case showed us that even in close proximity to a peer, alleged “professionals” are capable of hiding the truth from all five senses; auditory accounts of his sessions likely would not have been convicting. Thus, verbose dialogue with patients is essential. During internal pelvic procedures, forewarn the patient of each digital movement. We typically think of this as giving patients an opportunity to prepare for uncomfortable positional changes. However, prefacing your actions also gives patients a chance to object to them. Phrasing such as “I am going to turn my finger toward me to face the ceiling” will typically suffice. Also, whether it is their forearm or foreskin, verbally confirm permission before placing your hands on any patient. From initial evaluation to follow-up, “May I place my hand …” should precede each new hand contact made with a patient. If a patient responds, “I do not care, I just want to get better,” this should not be misconstrued as consent. Remind the patient, “It is your body and thus your choice. May I place my hand …?” Enforcing such a simple concept may protect the patient from future encounters with those who claim to be professionals. Dialogue works well to protect your patients and yourself when a peer is present or audio surveillance installed. But what can we do if these options are not available? For internal examinations conducted without a peer, I suggest the use of a two-way radio. One radio should be in the patient’s hand at all times, and the other with a staff member of the patient’s identified gender. While unconventional, the radio acts as a lifeline for patients with the push of a button. When using a two-way radio, I typically tell patients something to the effect of, “If you have any concerns with what is happening while we are working together, use the radio and (name) will come for help.” Establishing a quick and effective line of communication to an outside source, for patients, may decrease feelings of isolation. For the advancement of pelvic floor physical therapy, institutions such as The Section on Women's Health, Herman & Wallace and Evidence in Motion offer continuing education to physical therapists and physical therapy students. Likewise, courses offered at those institutions also discuss necessary ways to ethically manage your patients’ modesty and safety during pelvic floor evaluations and treatments. Obviously, we should always use gloves and lubricant and maintain an accurate record of procedures. However, Nassar still managed to conceal evidence that he operated outside of standard protocols. Your patients should always be confident that you, as their healthcare provider, were respectful of their person. Educating the patient, providing a peer, using an audio device, dictating your every movement, providing a lifeline, or some combination of these methods can reassure them. Remember, what is necessary is not always sufficient (hence this blog). If you follow all the standard protocols but do not go beyond to practices designed to make a patient feel truly comfortable and in control, there is a risk to their safety—you are doing what is necessary, but it is not sufficient. 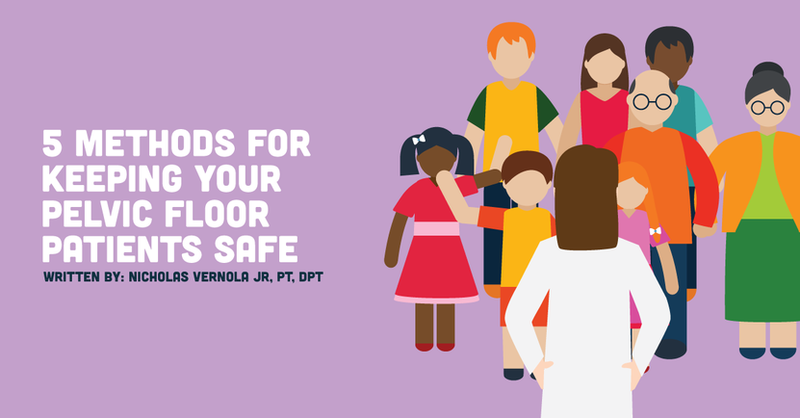 These strategies will increase safety for your patients. But they are not a guarantee. The laws, ethics, and procedures that guide us are in a constant state of flux, so we must be as versatile as those standards. All clinicians who work behind closed doors should continue to brainstorm and share ideas for keeping our patients and our practices safe from misconduct in the clinic. If you found this helpful, please share, comment below, and join the Aspiring Pelvic Health PTs and PTAs Facebook group. Also, for more information regarding pelvic health physical therapy, be sure to check out my website at DrNicholasVernolaJr.com. Beck JJ, Elzevier HW, Pelger RC, Putter H, Zalm PJV-VD. Multiple Pelvic Floor Complaints Are Correlated with Sexual Abuse History. The Journal of Sexual Medicine. 2009;6(1):193-198. doi:10.1111/j.1743-6109.2008.01045.x.